Camden World Gateway features one, two, three, and yes, even four bedroom apartment homes in the best location in Orlando, Florida! South International Drive corridor is right around the corner and we are only a few miles away from I-4, 417 Greenway and the Osceola Parkway. This location makes for an easy commute to anywhere in Orlando. Do you love the thrills of the nearby theme parks? 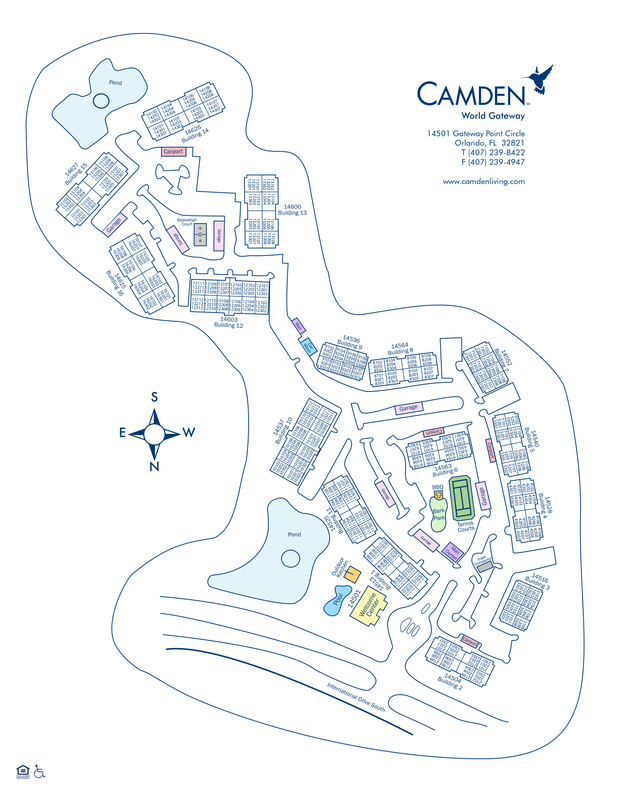 Camden World Gateway is only three minutes away from the main entrance of Walt Disney World theme parks which include Magic Kingdom, Animal Kingdom, Hollywood Studios, and EPCOT. Have even more fun at Disney Springs, Sea World or Universal Studios all located within a few miles of our community. If theme parks aren’t your thing, there are plenty of shopping destinations, including outlet malls, to fit your fancy. We are in the ideal location for everyone! In your new home, you will love the open-concept floor plans with plenty of space to entertain and relax with your family and friends. Love to cook? Our kitchens include a spacious pantry, beautiful wood cabinets and stainless steel appliances which are perfect for any cooking enthusiast. With full-size washers and dryers, huge walk-in closets and large screened patios Camden World Gateway has all of your needs covered. Need more space to hold your belongings? We have attached storage, bike storage and even detached garages are available to keep your vehicle out of the Florida sun. Love to be outside? Our outdoor basketball and tennis courts are calling your name. Take a relaxing dip in our pool, hang out in our BBQ picnic areas or make your car sparkly and clean at our car care center. We also offer a 24-hour fitness center with free weights and cardio equipment so you can meet your fitness goals. Come home to Camden World Gateway, where you can be a part of our cast. Call today to make an appointment to see your beautiful new apartment home! At Camden, your pets are family too! We welcome cats and dogs, up to three pets per apartment home with no pet weight limit. Call us with any pet-related questions! Get the perfect spot! We have ample open parking for our residents and visitors on a first-come, first-served basis. Select apartment homes include carports. Garages are ready for you to rent! Detached garages are available for $100 per month.